The writing has been on the wall for Central Asia for months now -- an economic crisis was coming to Central Asia and there was no way of avoiding it. There were unfortunately all too few ideas about how to mitigate it. One month into 2016 it is clear Central Asia has entered a difficult period, but it is unclear when and how the region might recover and what effect these particularly hard times might have on the people of the region. To discuss this new reality of Central Asia, today and for the foreseeable future, RFE/RL's Turkmen Service, known locally as Azatlyk, assembled a "majlis," or panel discussion. Azatlyk director Muhammad Tahir moderated the talk. Participating from London was Alex Nice, who covers Russia, the Caucasus, and Central Asia for the Economist Intelligence Unit, and Nate Schenkkan, the project director for Nations in Transit, Freedom House's annual survey of democratic governance from Central Europe to Eurasia and also author of a recent article in Foreign Policy, A Perfect Storm In Central Asia. And I...well, you know. Most of Central Asia's current problems originate with the falling price of oil and natural gas. This had a direct effect on Kazakhstan, where the economy is dependent on oil sales, as Nice said. "[In] Kazakhstan, the government estimates [the economy] grew by I think by 1.5 percent last year. We at the Economist Intelligence Unit think now that it will move into recession this year and contract for the first time since 1998," Nice said. Falling commodity prices have had an effect on Turkmenistan, where the economy is based on gas sales. However, as the panelists noted, Turkmenistan is so opaque that it is virtually impossible to know what is really happening inside the country. Falling commodity prices also directly affected Russia, where for years, millions of migrant laborers from Central Asia have found work. Remittances from these workers fell sharply in 2015 and Tajikistan and Kyrgyzstan are the two most remittance-dependent countries in the world, with money sent home being equivalent to more than 40 percent of Tajikistan's GDP and nearly 40 percent of Kyrgyzstan's GDP. Until the crisis hit Russia, citizens of Uzbekistan had been sending back more than $6 billion annually. Schenkkan pointed out that beyond the reduction in money these workers send back home, another "area of uncertainty, big uncertainty, is who comes home in terms of migrants." There are not many jobs waiting back in their homelands. Reports show some of these migrant laborers are migrating to other places within Russia. Some have suggested some of these Central Asian migrant laborers might simply go to another country to try to find work. But Nice suggested the options are fewer than some people believe. "Russia is obviously more attractive because of historic ties and the visa situation. However complicated it is for migrants to live in Russia, it's probably nevertheless easier than going to the Middle East, let alone Europe or other parts of Asia," Nice explained. Faced with a deteriorating economic situation, the response of the Kazakh and Tajik governments so far has been to crack down on potential dissent. Schenkkan drew attention to Tajikistan, where the government last year eliminated Central Asia's only registered Islamic party, the Islamic Renaissance Party of Tajikistan (IRPT), the second-largest party in Tajikistan. Schenkkan recalled that "the banning of the IRPT happened after the IRPT was essentially pushed out of parliament entirely after fraudulent elections, even more fraudulent than usual, and the IRPT has now been declared an extremist organization." Schenkkan also noted that while eliminating these potential political opponents, Tajik President Emomali Rahmon has been moving family members into high-level government posts, Rahmon's son Rustam Emomali, 28, is the head of the State Agency for Financial Control and Fight on Corruption (after serving as deputy Customs Agency chief and prior to that member of the Dushanbe parliament) and Rahmon just named daughter Ozoda, 38, head of the presidential administration on January 27. Kazakh President Nursultan Nazarbaev has been moving family members into prominent state positions for many years but last September eldest daughter Darigha became deputy prime minister, and just before the year ended Nazarbaev appointed his nephew Samat Abish, 37, to be deputy chief of the Committee for National Security. Squashing potential opposition and critics and consolidating the inner circles of power might provide a modicum of security for the ruling elites but the authorities nonetheless must implement austerity measures that in some cases are already proving unpopular with the people. 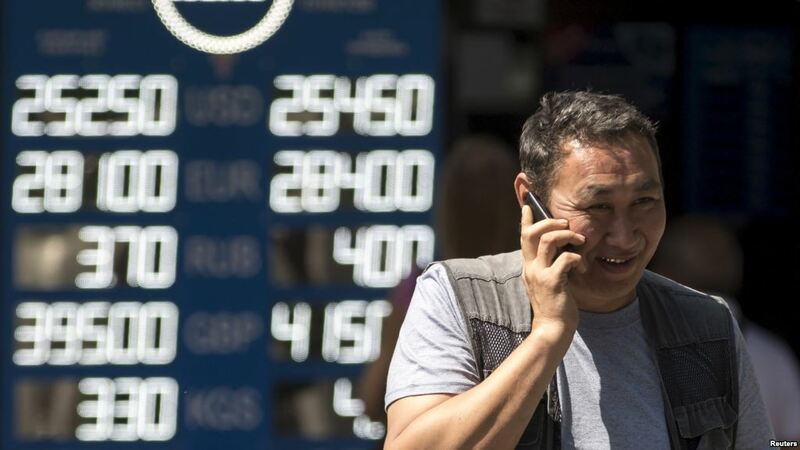 The exchange rates of all the Central Asian national currencies have been devalued, in Kazakhstan's case from about 180 tenges to the dollar, to more than 360 tenges to one dollar in barely six months. A group of people in Kazakhstan, where demonstrations are rare, who took out home loans based on dollars conducted a "gray mass" protest outside major banks in Almaty on January 16, demanding their loans be recalculated to the tenge rate when they acquired their loans. Some homeowners in Kyrgyzstan are demanding the same from their government. Even in Turkmenistan and Uzbekistan, where protests are unheard of, there are signs the people's patience is nearing an end. Some 200 unpaid workers in Turkmenistan's gas industry staged a protest over unpaid wages in the eastern city of Lebap in April 2015, the first reported protest in authoritarian Turkmenistan in 20 years. There are reports from Turkmen opposition websites that around half the workers in Turkmenistan's gas industry will need to be cut due to falling revenues. Reports from Uzbekistan indicate a growing number of workers, including state employees, are not receiving regular wages and banks are running short of money. Frustrations appear to be boiling over in, for now, isolated cases. Citizens of Uzbekistan have been unhappy but tolerant of frequent shortages of gas in their homes or gasoline for their cars for several years now. But on the evening of December 18 some 200 residents of a district in the city of Ferghana blocked the road leading to the nearby town of Margilan to protest a halt in gas to their homes. * Police and officials were able to disperse the crowd only after promising to deliver gas canisters to the district. The Central Asian governments have no solution to these problems; they cannot because the situation is out of their control for the most part. Schenkkan pointed out this puts Central Asian governments in a difficult situation since for years the leadership has said, "We can't have policies that present a picture of uncertainty to the population, we need to show everybody that this situation is stable." It will be a challenge to maintain this facade as social programs are cut, wages are reduced, arrears build up, and real unemployment rises. As Nice said, "It's hard to see really what the response is except unfortunately they will experience a couple of years of misery and a sharp fall in purchasing power and household wealth. It's difficult to see how that will be resolved." Qishloq Ovozi is a blog by RFE/RL Central Asia specialist Bruce Pannier that aims to look at the events that are shaping Central Asia and its respective countries, connect some of the dots to shed light on why those processes are occurring, and identify the agents of change. Content will draw on the extensive knowledge and contacts of RFE/RL's Central Asian services but also allow scholars in the West, particularly younger scholars who will be tomorrow’s experts on the region, opportunities to share their views on the evolving situation at this Eurasian crossroad. The name means "Village Voice" in Uzbek. But don't be fooled, Qishloq Ovozi is about all of Central Asia.